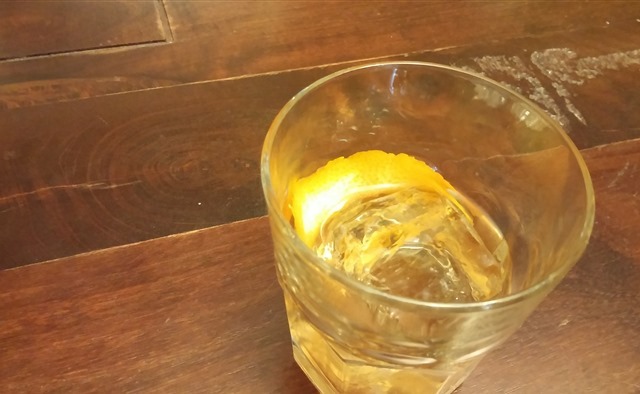 Many drinkers have a certain image in mind when you say the name Old Fashioned. They think of whiskey (unless they’re from Wisconsin), a sugar cube, and maybe some muddled oranges and cherries. In reality an Old Fashioned is any cocktail that contains exactly four ingredients: water, liquor, bitters, and sugar. It can be any combination of any form of those ingredients, as long as it has them and nothing else. Combine ingredients with ice, stir, and strain over a rocks glass filled with ice. Flame an orange peel and then drop it in. This entry was posted in Recipes and tagged classics, weekend classics on December 12, 2014 by Genius.